Our creative director, John Warner established his design practice [John Warner Studios] in 1996, and specialized in working with musicians, bands and special event promotion. He offers a wide range of custom illustration services, including creation of concert posters, t-shirts and other collectible merchandise, album covers and packaging, logo design, branding and identity creation, custom fonts and lettering, ad mat layout and more. 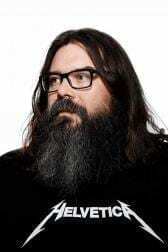 In addition to freelance design work, John is the creative director for the band, The Disco Biscuits. In his role at Hi-Line, John works together with a team of creative professionals to produce eye-catching artwork and products for our clients’ retail merchandise collections. Our screen-printer Kraig Biehl established his shop Texstyles in 1985. 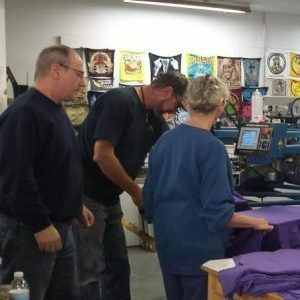 WIth over 30 years in business, he expertly produces top quality screen printed garments at a competitive price, utilizing process and spot process printing on a wide variety of goods including cotton, polyester, twill, spandex, bamboo and performance fabrics. Kraig supervises a dedicated and passionate staff, and offers clients up to 10 color printing and PMS color matching for outstanding results on any job. In partnership with John Warner, the shop now houses poster printing presses and produces screenprinted posters on a variety of paper options including foil posters.